Unemployment hits 18-year low. The closely watched nonfarm payrolls report, released this morning, showed the U.S. economy created fewer jobs than expected (164k versus 190k) but the overall employment level ticked higher as the labor force participation rate fell to 62.8, pushing the unemployment rate to an 18-year low of 3.9%; March’s initial figure was revised up by 32k to 135k. Wages grew 0.1% month over month in April, slightly below expectations of 0.2% growth, to put year-over-year wage growth at 2.6%, ahead of inflation but still signaling only modest signs of wage pressure. Though the headline payrolls figure came up short, the job gains represent solid growth in this stage of the business cycle, wage growth pressures remain contained, and the data suggest a very healthy labor market amid solid earnings growth; yet it likely doesn’t deter the Federal Reserve from a still-gradual path for rate hikes. Mixed data on service sector. The Institute for Supply Management’s (ISM) Non-Manufacturing Purchasing Managers’ Index (PMI) fell to 56.8 in April, a decline from March’s 58.8 and a sizable miss from expectations of 58.0 (above 50 indicated expansion). Nevertheless, some of the background data showed potential for continued strength. The new orders subindex, which tends to lead future activity, climbed to 60, while the competing survey from Markit came in slightly ahead of expectations at 54.6. While disappointing, service sector expansion remains healthy following a very strong first quarter and the data remain consistent with steady growth. Looking ahead. 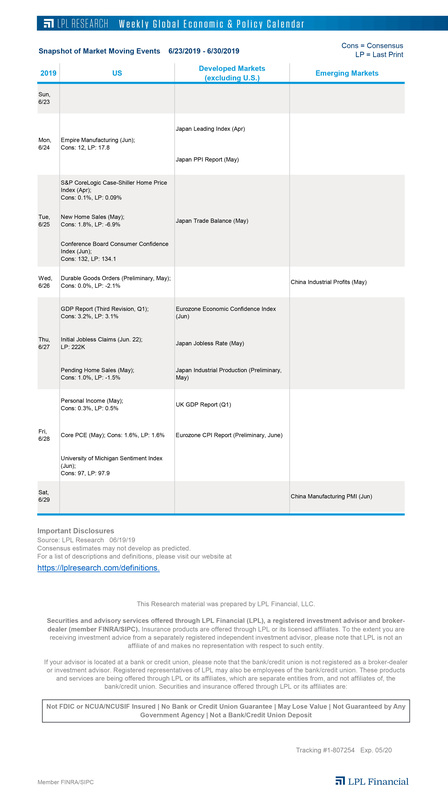 Next week’s economic calendar is highlighted by global trade data with import/export and national account figures scheduled for the United States, Germany, Japan, and China. Domestically, look for producer and consumer inflation data on Wednesday and Thursday, respectively; small business optimism and wholesale data (sales and inventories) are also noteworthy. Elsewhere, European data to monitor include industrial production figures out of Germany, France, and the United Kingdom; while the docket in Asia includes the minutes from the last Bank of Japan monetary policy meeting, and China’s consumer and producer inflation for April.